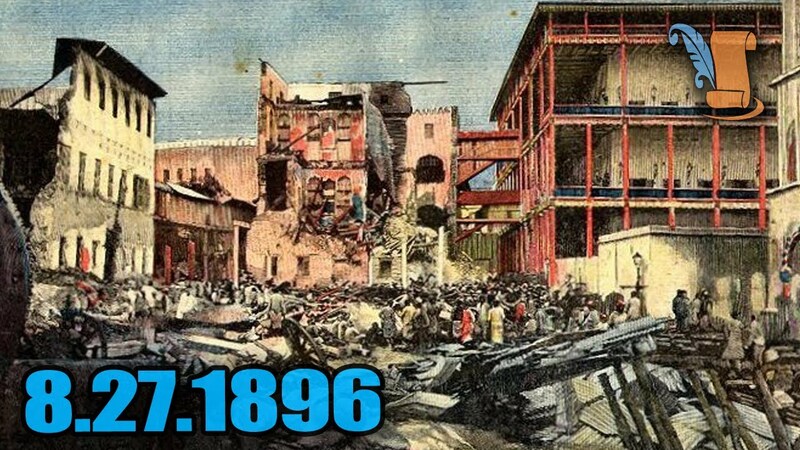 The Anglo-Zanzibar War was fought between the United Kingdom and Zanzibar on August 27, 1896. The immediate cause of the war was the death of the pro-British Sultan Hamad bin Thuwaini on 25 August 1896 and the following succession of Sultan Khalid bin Barghash, which was not approved by British consul. According to a treaty signed in 1886, a condition for becoming a sultan was that the candidate obtains the permission of the British consul. The British considered this a justification for acts of war and sent an ultimatum to Khalid demanding that he order his forces to stand down and leave the palace. In response, Khalid called up his palace guard and barricaded himself inside the palace. The ultimatum expired at 06:00 UTC (09:00 East Africa Time) on 27 August, by which time the British had gathered three cruisers, two gunships, 150 marines and sailors, and 900 Zanzibaris in the harbour area. Around 2,800 Zanzibaris defended the palace; most were recruited from the civilian population, but they also included the sultan’s palace guard and several hundred of his servants and slaves. The defenders had several artillery pieces and machine guns which were set in front of the palace sighted at the British ships. Bombarding which was opened at 06:02 set the palace on fire and disabled the defending artillery. A small naval action took place with the British sinking a Zanzibari royal yacht and two smaller vessels, and some shots were fired ineffectually at the pro-British Zanzibari troops as they approached the palace. The flag at the palace was taken down and fire ceased just 38 minutes later at 06:40, thus making this war the shortest war in written history. The sultan’s forces sustained roughly 500 casualties, while only one British sailor was injured. Sultan Khalid received asylum in the German consulate before escaping to Tanganyika. The British quickly placed Sultan Hamud in power at the head of a puppet government. The war marked the end of Zanzibar as a sovereign state and the start of a period of heavy British influence.